They will ace problems they thought were hopeless at first. Students learn strategies that greatly simplify complex problems. These include finding the invariant, reducing dimensions or mapping, choosing a different point of view, recasting, imposing symmetry, and numerous others. Socratic dialogs and realistic 3D worlds require frequent interactions which keep students immersed at all times. The math problems are interesting and most of them come from real life. An expert avatar, Prof. X. Plain, guides students through problems of increasing difficulty. Students are assessed non-intrusively during purposeful Socratic dialogs, and their learning is scaffolded by deeper and deeper visual explanations. 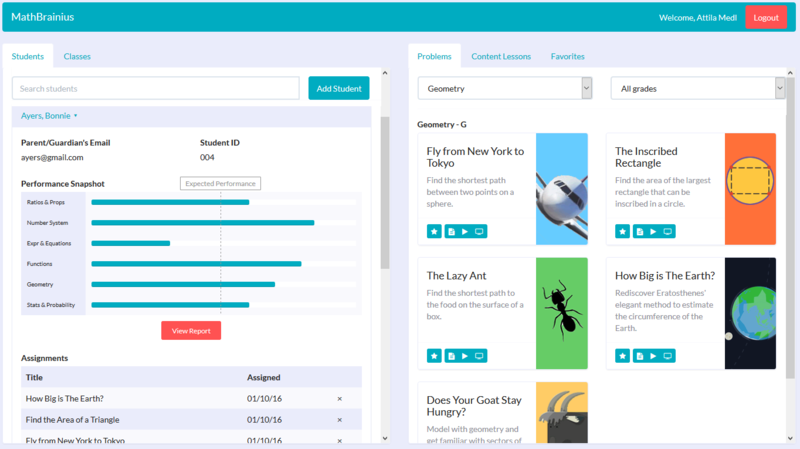 Educators can watch short synopsis videos of each problem, print a detailed lesson planning guide, and assign tasks to individual students or an entire class. The reporting is highly visual and detailed. Educators can easily find the weak spots of a student, whether they are in mathematical content or skill. Class-, grade-, and school-level reports are available at the district level. A team dedicated to education. Mgenuity Research was founded in 2012 with the goal of developing jaw-dropping educational software that illuminates and makes students deeply understand core concepts in science and mathematics. Our team includes a Presidential award-winning science educator, accomplished science writers, internationally known mathematicians and math-education experts, as well as 3D and software gurus. MathBrainius is supported by a National Science Foundation SBIR grant. © 2017 Mgenuity Corp. All Rights Reserved.